Influenced by modern and vintage belly dancers alike, Chantal is a graceful and enchanting performer described as "liquid gold", "luscious" and "a skillful and enigmatic catalyst between the music and the audience." She has performed on a variety of stages, from the Silk Road Caravan and Arcana sets at the Northern California Renaissance Pleasure Faire to the renowned Great American Music Hall, from small private house concerts to the famed Tipitina's and Joy Theater of New Orleans! Whatever the setting, she brings a fresh, inspired and artistic performance. Jumping in during her moms various favorite classes (Modern, Afro-Brazilian, Afro-Haitian and Congolese) as well as traveling to Asia throughout her childhood, studying Balinese dance for a month at the age of 6, she was exposed to the beauty of many cultures through the art of dance, music and movement. It wasn't until 2000, however, that she found a form that she was seriously passionate about. After seeing the well-known Bay Area group "Aywah! Ethnic Dance Company" which at that time included some of the most talented belly dancers in the Bay Area such as Zoe Jakes, Mira Betz, Rosa Rojas (now based out of L.A.), Hannah Romanowksy and Elizabeth Strong . After seeing their performance her heart was set on attending classes with the director: Katarina Burda. Chantal began performing after only a year of studying and was fortunate enough to share stages with the dancers who inspired her as well as incredible musicians including Sean Tergis, Peter Jaques, Helm (Mark and Ling Shien Bell), Tobias Roberson, Briana Waters, Calvin Lai, Lars Tergis, Matthew Furey and many more. This early foundation in performing improvised dance with live music had a strong impact on her style and is still her preference. She studied with Katarina for 5 years, the last year she was also a member of Aywah! In 2005 Chantal received a $4000 grant from the San Francisco Independent Scholars and used a large portion of it to travel to Nepal and study Charya Nritya (an ancient Buddhist dance form) with the lineage holder: Prajwal Vajracharya and one of his students: Ritu Bajracharya. The grant was also used for private lessons with Katarina which included focus on traditional dances and songs from Egypt, Turkey and Morocco. In 2006, Chantal was a member of a Bay Area belly dance and balkan music group "Bizim Mahalle" directed by Jessaiah Zure. Over the years she has studied the Turkish Roman 9/8 style of dance with Jessaiah Zure and Elizabeth Strong who have both traveled to Istanbul, Turkey to learn the form. In 2009 Chantal participated in a performance intensive with Mira Betz, studying the a deeper side of dance: character, storytelling and personal expression. In 2010 she began to study Belly Dance and Central Asian forms (Afghan, Persian, Tajik, Azeri and Uzbek) with the world-renowned dance artist: Miriam Peretz. During her time under Miriam's instruction, Chantal performed at the San Francisco Ethnic Dance Festival and Festival of the Silk Road with Afsaneh Dance Academy (part of Ballet Afsaneh directed by Sharlyn Sawyer). From 2012 to 2014 Chantal was a member of "MUSE Dance Collective" directed by Tamara Juel. They performed at local events in Santa Cruz as well as Tribal Fest and Ojai Bellydance Festival. From 2012 to 2015, Chantal was the dancer for Balkan Fusion group: Hot Blood Orkestar and performed with them throughout California. Currently residing in New Orleans, Louisiana, Chantal has formed the group BARIQ Bellydance Co. with Ashley Blair, Kerry Lynn and Misty Eve. It is a vintage inspired dance company pulling from Golden Era Raqs Sharqi, Ziegfeld Follies and California Tribal roots of the Jamila Salimpour lineage. Bolinas, CA, 2002 or 2003? Festival of the Silk Road in San Jose, CA, 2012. photo by The Dancing Moments. MUSE Dance Collective girls: Tamara, Misty and Chantal. Santa Cruz, CA, 2013. 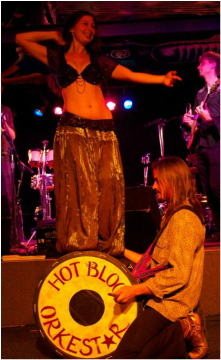 Performing with Hot Blood Orkestar, 2013. Ashley, Kerry Lynn, Chantal and Misty of BARIQ Bellydance Co. Photo by Adriane White, 2016. Photo by Sarrah Danziger, 2017.